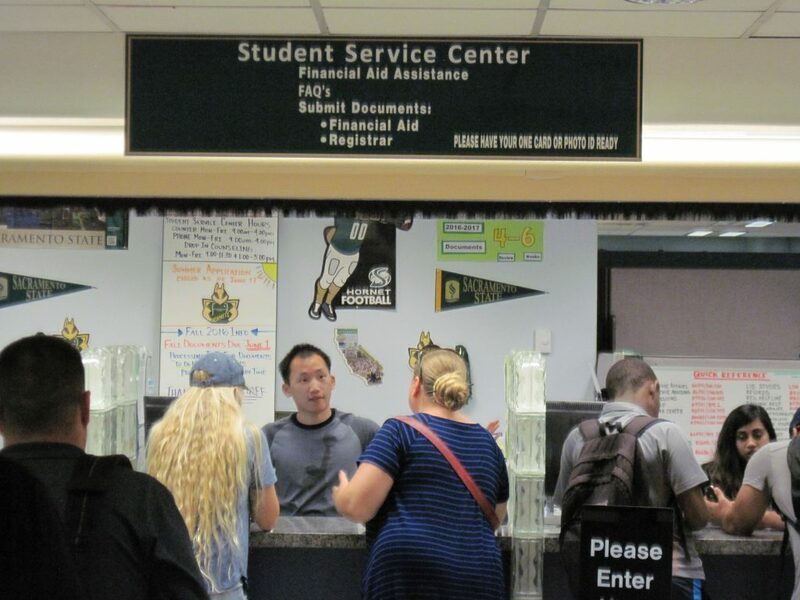 Sacramento State students line up to pay bills and receive financial aid information. The impact could be felt as soon as the 2019-20 school year. Various colleges and university systems such as the University of California have run their own studies and cost estimates. But the institutional and geographic sweep of the upcoming Student Expenses and Resources Survey (SEARS) is designed to encompass all of higher education around the state, administrators say. Funded with at least $100,000 from the College Futures Foundation in San Francisco, the survey will include students from UC, California State University, community colleges, private not-for-profit colleges and private proprietary trade and career schools. As many as 380 campuses across many regions of California are expected to participate when the online and phone-app-friendly survey questions are sent out to students in March or April. The survey will be designed to take a representative sample of each type of school and various regions. The commission’s current estimate says that average non-tuition costs for California college students living off campus this year is $19,386, including housing, food, transportation, supplies and some other items. Students complain that costs are actually higher in many parts of the state. The upcoming survey is really a revival. It will restart the Student Expenses and Resources Survey that was conducted every three years from 1971 to 2006 but abandoned because of funding problems. Since 2006, the commission has estimated costs based on inflation, a method that administrators concede produces inaccurately low figures. Details about the survey, including specific questions and what type of financial incentive or coupon might be offered to participants, remain to be worked out over the next two months. The last SEARS included questions about how far housing was from campus, the amount of students’ credit card debt, the details of food costs cooked at home and bought at school or restaurants, the costs of computers, recreation, hobbies and sports. Reflecting students’ current lifestyles, the upcoming one is likely to include more questions about the costs of cell phones, Internet services and other technology, officials said. The survey will seek to find out differences in student housing costs in, for example, Chico, Berkeley, Bakersfield and San Diego, along with information about numbers of roommates and the size of the apartments and houses. It will also ask students about expenses for health care, child care and about their revenues, grants, loans, jobs and their support from families. A Cal State survey shows a wide variety in costs depending on location. Off-campus housing and food range from $11,862 a year at Chico State to $14,502 at San Jose State, while on-campus housing and food range from $9,704 at Fresno State to $15,966 at San Diego State. The UC system estimates that non-tuition costs total about $20,800 for an on-campus resident and about $17,700 for off-campus; that is in addition to the $13,900 average in mandatory tuition and systemwide and campus fees but before financial aid is awarded. A UC study group in November released a report that called for increased grants to better cover living expenses and support for students to attend summer school classes, among other things. It also said that methods for estimating students’ costs needed to be improved. Alcalá said she hoped the survey answers may sway state legislators and colleges to bolster financial aid awards. “It’s going to put pressures on institutions and the Legislature to provide more assistance for the total cost of attendance, not just for tuition and fees,” she said. The nonprofit College Futures Foundation also hopes that the survey ultimately leads to increased financial aid to help more low-income and under-represented students enroll in and complete college, according to Kendall Guthrie, the foundation’s chief learning officer. “We are particularly interested in supporting the study for additional information for policy makers around the state to understand what students’ costs of attendance are and what kind of college aid is needed to complete their college degree,” she said. Guthrie said she especially looked forward to the survey’s insights into students who are older than 24, their family situations and such costs as child care and transportation. The foundation is providing the $100,000, and possibly more if need be, for the contract recently awarded to Mathematica Policy Research, a nonpartisan research organization with education expertise. Mathematica Policy Research will help develop the questionnaire, administer it and compile results. Commission staff and an advisory panel of education officials, students and policy experts are setting priorities, working on questions and overseeing the work. While the goal of 100,000 or so respondents may seem enormous, that number is only about 3 percent of all the students enrolled in California higher education. The survey’s revival is being applauded by various groups, including the student association across the 23-campus Cal State system and the Association of Independent California Colleges and Universities (AICCU), which represents 70 nonprofit institutions. Kristen Soares, president of the independent college association, said the results will help her member colleges prepare financial aid packages, help them seek additional gifts from donors and aid in lobbying the Legislature for larger Cal Grants. “Keeping college affordable is tough but we need to address that,” Soares said. Steal from Peter to subsidize Paul? That is what has made a mess of UC funding since 1960. Today, Californians and others can’t afford to send their children to University. What happened? The essential bases for the lack of current funding are: the electorate became fragmented (e pluribus multum and a resultant diminution of “sense of collective responsibility”), California became overpopulated, the additional population did not reflect the economic substance and integrity of the population of the first hundred years, immigration driven excess population placed enormous pressure on resources, and drove up the cost of land and derivative costs way beyond inflation, and because millions of the newcomers were poor, their taxes didn’t begin to cover the costs of K-12, welfare, etc for their families, and many of their children ended up in prison. As a consequence (somewhat simplified) State funds previously used to support the University were diverted to increased funding of K-12, to prisons, and to welfare.